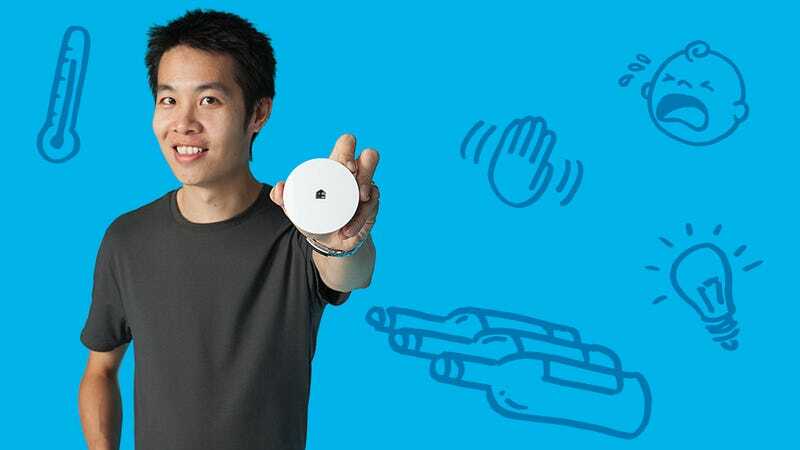 With the help of the innovative design company, Quirky, Denny Choun Wai Fong invented a gadget that solves a problem that’s held humans back since…well, forever: we only have one set of eyes and ears. Can you think of a better gift this holiday season than a tool that essentially enables your family and friends to be in multiple places at once? With input and influence from the creative members of the Quirky community, Denny was able to turn this concept into a product called Spotter. Now he's helping you get your holiday shopping done early, so the mall is one place you won't have be in the next few weeks. While his appliances had alerts, it was impossible to keep track of everything with a crying baby requiring constant diaper changes. Denny needed a device that kept him aware of the status of a number of appliances by sending information directly to his phone — but this only invited further inspiration. He realized he could also incorporate motion sensors to monitor doors, lights and drawers. As he delved further into his idea, “the possibilities became endless.” Quirky offered the ideal collaborative environment to make an invention out of Denny’s inspiration. The sleek, simple Spotter is a gadget with countless uses. The Spotter is the perfect gift to ease the chaos of holiday cooking and family gatherings because, as Denny says, “it's all about spending more time with the people one cares about and less time running around checking things.” It’s no surprise that the Quirky approach to design and invention has enabled its members to create and influence some pretty cool gadgets. Check out Denny’s favorite gift-worthy Quirky inventions, and prepare giftees to be in awe of your skills. There are a ton of amazing Quirky gadgets ready to be wrapped, and even more making their way from concept to product via the Quirky community. Head here to check out the Quirky community.